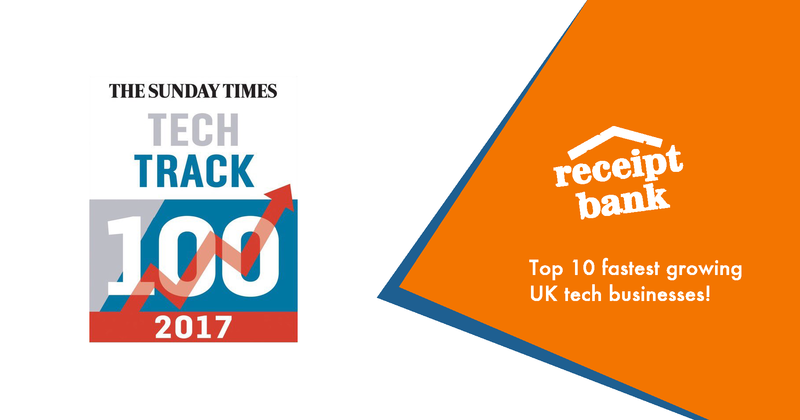 The Sunday Times Hiscox Tech Track 100 league table ranks the top 100 private British technology, media and telecoms (TMT) companies according to the fastest-growing revenues over the past three years. Alexis Prenn, CEO, Receipt Bank, commented: “The rapid growth that led to this achievement demonstrates the appetite and scope for the innovation we are introducing to the accounting and bookkeeping industry. It highlights the real value of new and efficient bookkeeping technology at this pivotal moment for the sector. This accolade comes just months after Receipt Bank raised US$50 million in Series B funding, one of the largest funding rounds for a UK business in the past year, bringing total funding to date to US$65 million. Receipt Bank has been revolutionising bookkeeping for small business since its launch in 2010. Working with the leading accountants and bookkeepers around the world, it was the first software company to automate the collection and data extraction of receipts and invoices. Today, Receipt Bank automates a range of bookkeeping processes for more than 5,000 accounting and bookkeeping firms and over 100,000 of their small business clients across the core markets of North America, EMEA and Australia.